Mac OS Sierra with Siri checking on a baseball game. Screen shot courtesy of Coyote Moon, Inc.
You know Siri. She's that quirky personal voice assistant that you use on your iPhone and other iOS devices. Well, now's Siri is on Mac and ready to do her best to be a help and not a hindrance. Now, even though you're familiar with Siri, it's important to keep in mind that Siri on Mac doesn't work quite like Siri on iOS devices. If you have an iPhone, you're probably used to saying "Hey Siri" to start a session with Siri. You may be asking for the weather, or directions, perhaps a really good pizza joint. Regardless of the question, you need to ask, you usually start the conversation by getting the attention of the personal voice assistant by saying, "Hey Siri." Saying "Hey Siri" will even get the attention of the miniature assistant stuffed into the Apple Watch. But when it comes to the Mac, no amount of voice-based prodding is going to get Siri's attention. Seems the Mac and Apple have turned a deaf ear to the Hey Siri phrase, and instead force you to use keyboard combinations, or mouse or trackpad clicks, to get Siri to wake up and listen to your requests. Apple may have chosen to leave Siri deaf until you manually turn the assistant on, but it doesn’t have to be that way. The Mac has been able to take dictation and turn your voice into words since the release of OS X Mountain Lion. It wasn't the best of dictation apps out there at the time, but it would eventually become a powerful core service of the Mac OS. By the time OS X Mavericks came about, Dictation had been improved. 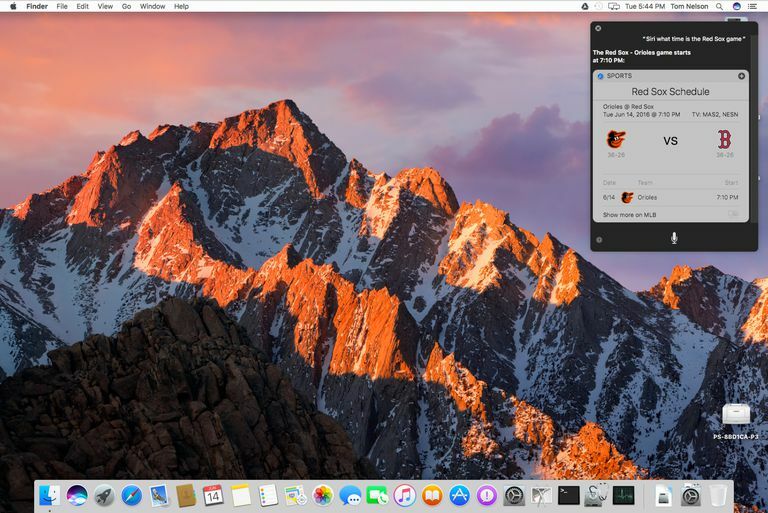 It not only could be used for converting your spoken voice to words, but you could also assign certain words and phrases to be used as commands to control various Mac services, features, and apps. It's this feature of Dictation that we're going to use to enable Siri to wake up and respond when she hears the familiar Hey Siri greeting. Actually, you're not stuck with Hey Siri; you can use any word or phrase you want; "Hey What's Your Name," or "Answer Me This." It's up to you what phrase to use, though I'll demonstrate the process with the old favorite, Hey Siri. The first step is to enable Siri. To do this, you need a Mac running macOS Sierra or later, as well as a decent quality internal or external microphone. The hardest part of this process is coming up with a unique combination of keys that, when pressed, will enable Siri. Apple provides its developers a list of keyboard shortcuts used globally by macOS. It's not a good idea to use any of the keyboard shortcuts listed in the Keyboard Shortcuts for macOS table. I decided to use Ctrl + period (⌃.) since Apple uses the period sparingly for keyboard shortcuts. There's still no guarantee that an individual app isn't already using this combination, but so far, it has worked for me. Launch System Preferences by clicking on its icon in the Dock, or selecting System Preferences from the Apple menu. In the System Preferences window, select the Siri preference pane. In the Siri preference pane, locate the popup menu next to the keyboard shortcuts text, and then use the menu to select Customize. Press the Ctrl + period keys (or whichever keyboard shortcut you wish to use). Return to the full list of preference panes by clicking Back in the Siri preference pane toolbar. In the System Preferences window, select the Keyboard preference pane. Select the Dictation tab in the Keyboard preference pane window. Click the box labeled Use Enhanced Dictation. Dictation can be performed either by remote Apple servers, which takes a computational load off your Mac, or it can be performed locally on your Mac. The advantage of selecting Enhanced Dictation is that your Mac will perform the conversion, and no data will be sent to Apple. Enhanced Dictation requires a download to your Mac of the Dictation Translation system; it may take a few minutes. Once the download is complete, you can return to the main System Preferences window by selecting Back in the preference pane toolbar. To enable voice commands, we're going to use the accessibility preference pane to associate a phrase with the keyword shortcut we created for Siri. In the System Preferences window, select the Accessibility preference pane. Scroll down to select the Dictation item. Place a checkmark in the box labeled Enable the Dictation Keyword Phrase. In the field just below the checkbox, enter the keyword phrase 'Hey' (without the quotes). The word Hey will be used to activate the Dictation system. Place a checkbox in the box labeled Enable Advanced Commands. Click the plus sign (+) to add a new command. In the field labeled When I say, enter the word Siri. Use the dropdown menu next to While using to select Any Application. Use the dropdown menu next to Perform to choose the action to be performed when the word Siri is detected. In this case, select Press Keyboard Shortcut. That's everything you need to do to allow Siri to be voice activated on your Mac. You're now ready to give Siri on Mac a try. Go ahead and say "Hey Siri." The Siri window should open, asking, What can I help you with today? Ask Siri about the weather, where to find a good pizza joint, or to open Lifewire.com.